Hello everybody, hope you had a fun weekend spending quality time with friends, family or even the Marlins. The Fighting Fish really took advantage of the home cooking against two formidable teams, ending the first half of the season on a high note. Christian Yelich and the Brew Crew rolled into Miami with the best record in the National League, but don’t tell the Marlins that. Jose Ureña opened the series while Bryan Holaday filled in for All-Star J.T. Realmuto, who went on paternity leave as a first-time father. Little did Holaday know he was going to play much more than the role of backup Monday night. 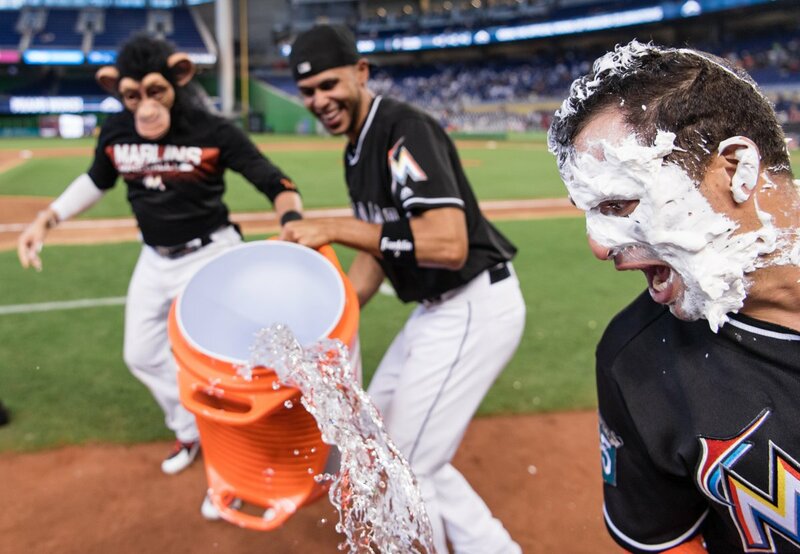 Ureña did his part pitching nearly six innings of two-run ball while Starlin Castro and Brian Anderson hit back to back home runs in the seventh to take the lead. Milwaukee responded in the eighth with Travis Shaw hitting a line drive off of Drew Steckenrider to right field, scoring Yelich to eventually send this game into extras. Enter Mr. Holday. The backstop got a hold of one, slipping a grounder right up the middle allowing Miguel Rojas to rush home for the walk off, 4-3 Marlins. Game 2 saw former Marlin Christian Yelich go 3-for-5 with 4 RBIs on a night where the Brew Crew dominated nearly from start to finish. The Marlins scored two in the first for an early lead thanks to Garrett Cooper and JT Riddle, but the Brewers retaliated with four in the second en route to an 8-4 win. Marlins hurler Pablo Lopez lasted six frames giving up five runs on six hits, fanning six more in the losing effort. The rubber match showed even more walk off magic. Miami scored three in the fourth to take the lead, but Jesus Aguilar nailed a 2-run double in the eighth, knotting it up 4-4. Fast forwarding to the twelfth, Castro hit a grounder to left as Cooper raced around third, gunning it for home. Yelich scooped up the ball but his throw was off the mark as the Marlins ran away with the series, winning 5-4 in extras. Dan Straily ( 6 IP, 4 Hits, 2 Runs, 1 ER, 7 Ks) got the no decision while Elieser Hernandez notched his first win. From the best in the NL to the beasts of the East. The Philadelphia Phillies came into town for a weekend series as Jake Arrieta and Wei Yin Chen started things off. Arrieta bullied the Marlins all night Friday, handcuffing the team to just three hits through seven frames (Phil’s bullpen didn’t allow a hit). Meanwhile, Chen lasted six, giving up a single run on eight hits, collecting 8 K’s of his own in the pitcher’s duel. It’s all Philly would need, claiming the first matchup 2-0. The two division rivals traded places as Miami turned the tables and issued the Phillies their own 2-0 shutout the following game. Trevor Richards went 6-deep, sprinkling four hits with the bullpen (Brad Ziegler, Steckenrider and Kyle Barraclough) taking over and doing their part ensuring that Philadelphia kept throwing up donuts. The Marlins broke through Aaron Nola in the first with Castro grounding into a force-out, allowing Derek Dietrich to score, followed by an RBI single by Martin Prado. They had already won, they just didn’t know it yet. The effort spoiled the righty’s (Mostly) great outing. For the finale, it was Jose Ureña squaring off against Phillies rookie Enyel De Los Santos making his second career start. Urena was cruising until the Phils bruised him for 5 runs in the fourth, including a bases clearing triple by Cesar Hernandez. It looked like the city of brotherly love was going to have fish fry for dinner but not today. Cameron Maybin hit a solo shot followed by a 3-run blast from Anderson, putting Miami to within one. Timely hits from Rojas and Bour capped off an incredible 8-run fifth. The Marlins added two more in the eighth to win it, 10-5. BALLGAME! With the first half of the season in the books, I have compiled the grades of most of the players and the team itself, as promised. Following the long report card, I’ll touch up on some of the players. So without further ado! Brian Anderson has been playing great as well. If this keeps up into the second half, the kid should be getting looks and an active conversation for the Rookie of the Year Award. I’m serious. I watched him a lot last year, putting in little blurbs of his performance here and there, eagerly awaiting his call-up from New Orleans. Now that he’s here its been an awesome ride. Ever since we traded away Giancarlo Stanton and Marcell Ozuna, its fallen on Justin Bour to keep the power on. He leads the team with 15 round trippers. While both his average (.239) and slugging (.418) are down this year (His OPS of .780 is middle echelon), he’s on pace to deliver 20-25 HRs for us by season’s end. Assuming he isn’t traded first. Speaking of down, now it’s Lewis Brinson’s turn. He has done a lot to improve his game. Prior to his injury, he had a respectable month of June, batting .267, managing to smash four homers in the process to bring his total to 10 on the year. Considering he hit .139 in April and .137 in May, that’s a tremendous improvement. Also, his strikeout rate has been steadily trending down month to month (April: 33 SOs, May: 29 SOs, June: 25 SOs). However, with all that said, Brinson is still batting below the Mendoza Line and his overall stats look dismal. Give it time. Now for the pitchers! Some of you might be wondering why I gave a C+ to Urena. It’s pretty much because the majority of his losses, heck I’d say most even, are due to very poor run support. When you look closer at his games, he gives up three or four runs tops. In fact, he’s only given up five runs (his max) only three times this year. This is probably why they brought him back into the roster after his injury, nothing warranted getting sent to the minors. For a rookie, Trevor Richards sure is holding his own. Heading into the break he is 3-5 with a 4.74 ERA. Not bad all things considering. But another stat that really caught my eye was in nearly 63 innings pitched, the kid has 57 K’s. His walks (31) are concerning but given it’s his first year, things are looking up for the youngster. Now to close the deal. Ever since becoming the team’s closer, Kyle Barraclough has been pretty effective. He’s converted 9 of 12 opportunities and shines a nice 47 Ks in 42.1 innings of work. Hitters are managing a measly .126 average against him, it even worked out for Ziegler for his relief work since the demotion has left little to complain about. Until next time sports fans, stay frosty! Views from the Cheap Seats is a recurring segment where a Miami raised sports nut recaps, screams and analyses a week’s worth of games giving a toast, or the finger, to his hometown team depending on their performance. A truly hopeful but always realistic fan putting thoughts to pen to paper and always striving to improve. Be bold, be good, be you.